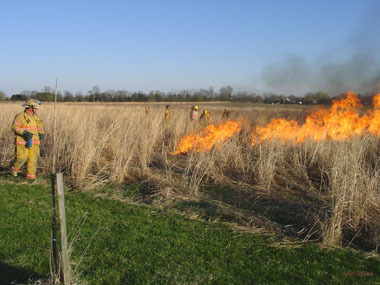 a fire break at boundary of "burned" and "control" plots. between "burned" and "control" plots prior to the fire (top photo). reminding us of the prairie history of the Cedarville area. PRAIRIE Working Group - Who? What? Why? 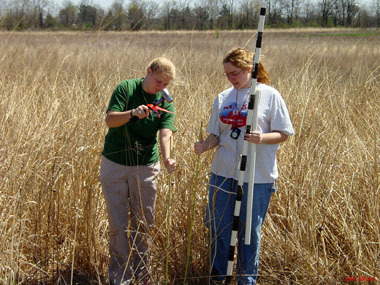 From its beginning in 1999 to the fifth anniversary of the Prairie Restoration Project, an increasing number of people have contributed to the effort. Thanks go to the university for their financial support and encouragement. 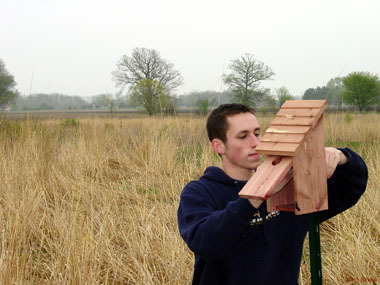 We are thankful for the partnership and counsel provided by Mr. Lynn Holtzman, ODNR Division of Wildlife; a brother who has established a reputation in prairie restoration in western Ohio. Thanks also to Paul Ware and Glenn Knauff of the Grounds Department and Paul Mitchell, Supt. of the Water Plant for their cooperation in maintaining the access roads. Scott Baldwin, Township Fire Chief and his fine crew have become prairie fire experts and are so quick to come into action (photo left). Most importantly, however, is the interest of Cedarville students with whom it is a privilege to work. the soil in simulation of the tramping of bison or other large prairie grazers. To engage in Biblical environmental stewardship through practical involvement in projects that promote native habitat restoration and/or conservation through the cooperation of university faculty, local government officials, and interested citizens. By such efforts, we develop channels of awareness and understanding that can result in both restoration of the land and reconciliation of humankind with God and with His creation. 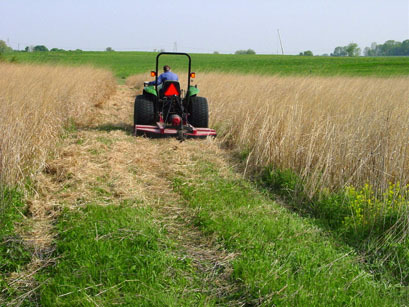 The PRAIRIE Working group has recently undertaken a more systematic effort to learn the dynamics of the Prairie Restoration Site. The following web pages outline some of the major research efforts since 2005, beginning with “Decreasing the Dominants"